Dulse (Palmaria sp.) grows in the wild along the Pacific and Atlantic coastlines. It is harvested and usually sold for up to $90 a pound in dried form as a cooking ingredient or nutritional supplement. But researcher Chris Langdon and colleagues at OSU's Hatfield Marine Science Center have created and patented a new strain of dulse – one he has been growing for the past 15 years. 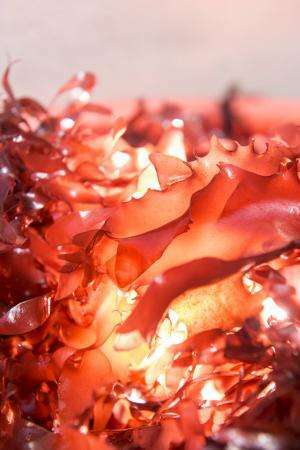 The research team received a grant from the Oregon Department of Agriculture to explore dulse as a "specialty crop" – the first time a seaweed had made the list, according to Food Innovation Center director Michael Morrissey. Please let me know where I can get this seaweed. Thank you. I love this, considering that I love seaweed, smoked bacon flavor and that I don't eat non kosher/halal foods! The science is great and all credit to those who might use this to save the planet and reduce global warming etc ...but at $90 a pound wouldn't bacon be a cheaper alternative?